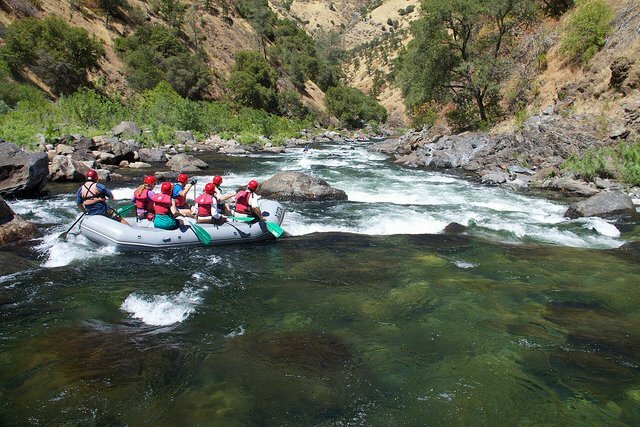 The Cherry Creek section of the Tuolumne River is probably the most challenging whitewater adventure in the United States. It’s 9 miles of Class V+ rapids with an average gradient of of 110 feet per mile — and one section where you’ll drop 200 feet in the space of one short mile. For a slightly less intense and longer run down this classic California river, put in at Meral’s Pool and travel 18 miles of Class IV rapids to Ward’s Ferry. The Tuolumne is located in the heart of the Sierra Nevadas, in some of California’s most beautiful mountain landscape. Whitewater season is especially long and welcoming here — any time between March and October you’re guaranteed a heart-stopping run through equally amazing scenery. Sun Kosi means “River of Gold,” and this mighty river fed by Himalayan glaciers is pure gold for adventure travelers. 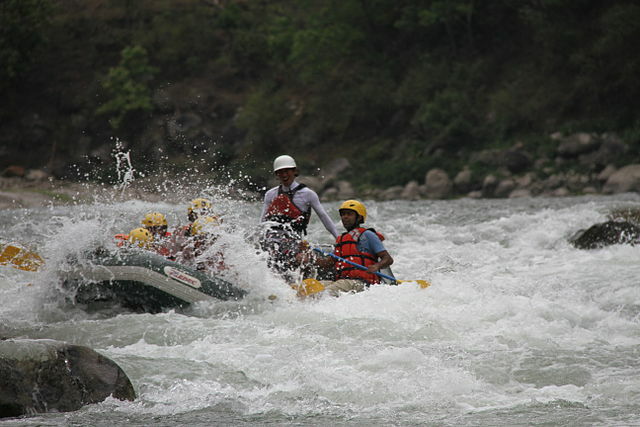 From your put-in at Dolalghat in central Nepal to your take-out almost 170 miles downriver at Chatra Gorge, you’ll navigate long stretches of Class V rapids through narrow gorges and mountain canyons. Mix in great overnight camping on pristine white sand beaches, views of the legendary Himalayas, and a final stretch through tropical jungle filled with wildlife and you’ve got stories to last a lifetime. It takes about 10 days to complete the Sun Kosi River run, and it’s only accessible to commercial tours between September and January. The rest of the year glacial melt triples the size of the river and makes it completely unrunnable. The Magpie River whitewater adventure is a challenge before you even get to the river. The only way to reach this remote region deep in the pine and spruce forests of eastern Quebec is by landing a float plane on the chilly blue waters of Magpie Lake. 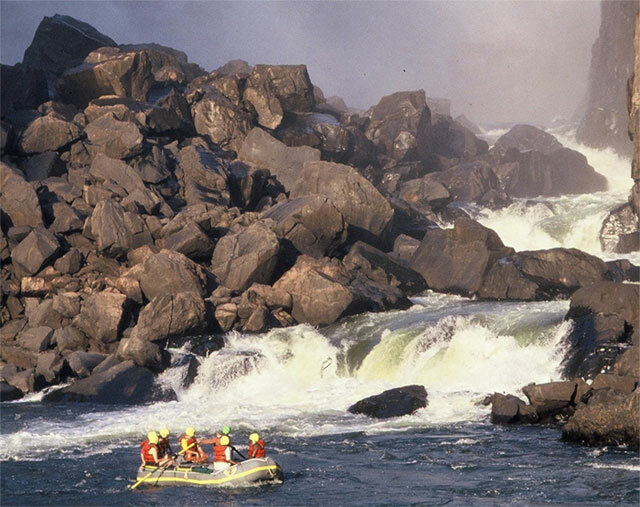 The fun starts almost as soon as you hit the water and continues as the river cuts its way through granite gorges and nearly endless sections of Class III and IV rapids. If you’ve got time to take a look at the shoreline, you’ll likely see black bears, wolves, moose, and osprey. And at night, there are spectacular views of the Northern Lights. The 8-day run culminates in wild Class V rapids just downriver from Magpie Falls. The best time to make this incredible river run is August through September — and make it soon, because this is currently an unprotected region and the local power company has long-term plans to dam it up. Looking for an unforgettable one-day river run? Most whitewater aficionados agree — there’s no better single-day run in the world than Batoka Gorge, at the foot of Victoria Falls on the Zambezi River. 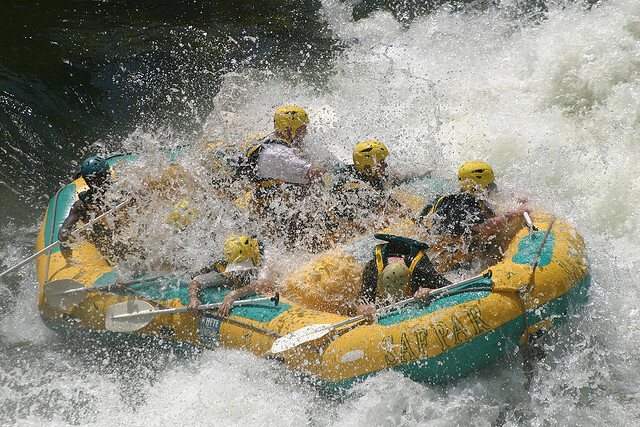 With 23 rapids in a compact 15-mile run, the treacherous Zambezi provides a lot of thrills packed into one thoroughly wet and wild day. You’ll get a feel for the adrenaline rush of this trip just from the names of the Class IV and V rapids: “Gnashing Jaws of Death,” “Devil’s Toilet Bowl,” or “Commercial Suicide.” Oh – and don’t forget the last section of this thrilling run. It’s called “Oblivion,” and only about a quarter of all rafters make it through here without flipping. Prime time for running the Zambezi is July through mid-February, when the water is low. An especially heavy rainy season may close the river entirely during April and May. Class V rapids in the daylight, showers, flush toilets, and gourmet meals at night — if this sounds like your version of paradise, head to the Rio Futaleufú in the Patagonian region of Chile. This brilliant turquoise river is fed by Andean glaciers, and it gets its striking color from the high mineral content of the mountain runoff. Running the river by kayak or raft can be a full or half-day adventure — but there’s lots more to do here, with beautiful hiking trails, ziplining, horseback riding and rock climbing all within close proximity to your whitewater destination. Located in the middle of some of the world’s most spectacular scenery, the Rio Futaleufú is currently under consideration for a hydroelectric dam, so if you want to experience this amazing river, make your plans sooner rather than later.